Another vital everyday maths skill, the ability to measure objects and convert between different units. Here we have worksheets, PowerPoints and other resources regarding length, area and volume. A useful functional skills based worksheet, perfect for rounding up the area topic. Pupils need to use their area knowledge to calculate the cost of insulating the loft and how long it will take the changes to pay for themselves. Another functional skills based worksheet containing the same numbers as the worksheet above, but with easier numbers to use. Here is a video I made as a revision on the areas of various 2d shapes. It's available on YouTube or through the panel on the left. This sheet can be chopped into two to make a quick easy starter. Pupils need to find the area and perimeter of a rectangle, parallelogram and triangle. Perfect for checking previous knowledge of area formulae or as a quick reminder of the previous lesson's work. 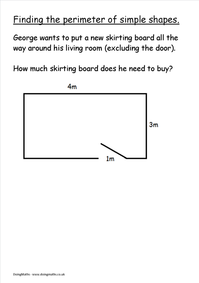 This quick worksheet introduces the idea or perimeter by asking students to work out how much skirting board they would need to go all the way around the shown room.